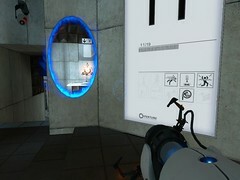 Simultaneously, the best and worst thing about Portal is the ending. You know the drill if you’ve seen the video. You have a portal gun which will shoot two doors into the scenery. You are being put though a series of tests. This is the game. It is a puzzle game, created and built with the care and attention to detail that the Valve games all shimmer with gently. In the manner of an RTS game it continues to introduce new elements right up until the final element, you don’t get the full stack until you’re nearly finished. This is unlike any other puzzle game, to a large extent. Plus, the ‘lab rat’ setting does give the entire game the feel of an extended tutorial, and the central mechanic doesn’t seem to be enough to base an entire game around. What makes the game is the environment. …and I’ll stop. 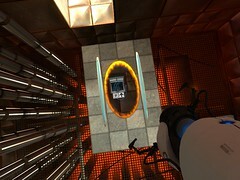 The best and worst thing about Portal is the ending, it’s good because the actual arc and ending is one of the single most satisfying and well executed ending of a game for a long time (And proof that, despite appearances, Valve can write them) (You may have heard the rumour that The Orange Box contains a Jonathon Coulton song. 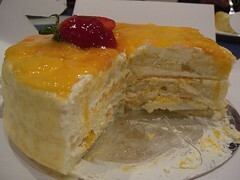 It’s in Portal. If you ever intend to finish portal, do not seek out the song, yet). The worst bit about the ending is that it happens too soon. That’s it. For a game that’s $20 on its own, or free if you buy TF2 & HL:Ep2, four or so hours of this level of innovation is well worth it, and that’s without any of the bonus maps, challenges or the fact you will be promising cake to your friends for months.